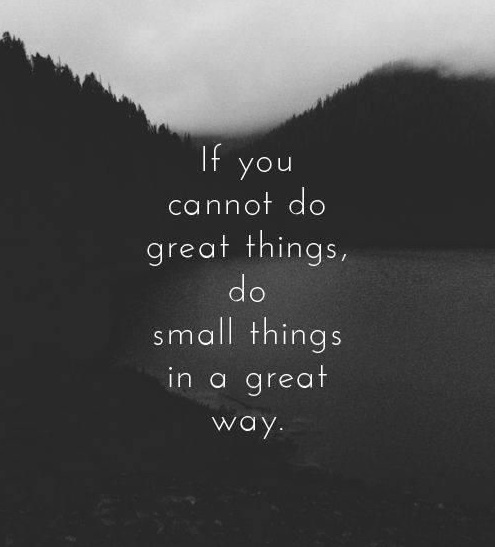 Great things are accomplished more often in small steps, rather than in great leaps. It doesn’t matter if your goal is ridiculously challenging, or if it is painfully simple (like sitting down to meditate every day) and you just can’t seem to do it. Successful and peaceful people have learned that big goals take tiny, baby steps to accomplish. To illustrate the importance of small steps we can look to the mysterious way in which Michelangelo carved his sculptures. Michelangelo’s friend and biographer, Giorgio Vasari, describes a tedious method the master artist used to carve figures out of stone. Michelangelo laid his model for a project down in a box like a coffin. He then filled the box until the figure was submerged. The water was slowly allowed to drip out, or he removed it a bit at time, to see which parts of the figure would emerge first – like an archipelago peeping out from the ocean’s surface. This is how he would know which parts to cut first in his stone block. Sometimes it would be a hip, other times it would be a nose, or a shoulder. The method was very imprecise, and took many hours of observation before he could even get to the task of carving a masterpiece out of marble or granite. You could use the sheer number of mindfulness techniques and practices as a means of procrastination if you really wanted to. One could spend years studying the different wisdom traditions (yoga, tai chi, qi gong, Zen, centering prayer, chanting, transcendental meditation, etc.) to come to a singular practice, but intentional, nonjudgmental awareness of our moment-to-moment experience can be practiced right now. Just pick one practice, and do it every single day. Set an alarm on your cell phone. Write yourself a note and stick it in your wallet to remind yourself, or put a rubber band around your wrist and every time you see it, do the practice. If you don’t know where to start, just dive in. Don’t let ignorance be an excuse to keep mindfulness at bay. You can always learn as you go. According to Jon Kabat-Zinn, a Jewish-born, Harvard graduated microbiology Ph.D. who once taught at the University of Massachusetts Medical Center, and later became a student of the Zen Buddhist monk, Thich Nhat Hanh – Buddhist meditation is not a religion. Neither is Vipassana from ancient India. What is common to all forms of mindfulness is that they are a means to focus our attention, cultivate awareness, and pay more attention to our inattention. You can be Christian, Buddhist, Jain, Hindu, Muslim, Jewish, even atheist, and still practice mindfulness. If you need to marry your mindfulness practice with your current religious beliefs, that’s o.k., but don’t let your religious background stop you from taking small steps every day. If you are Christian, your mindfulness practice may simply be, “Thank you, God.” If you are Buddhist, it might be a five-minute chant of the mantra, “Om Mani Padme Hum”, which translates to mean, the jewel is in the lotus (the third eye.) If you are Hindu, you can simply sit quietly and say, “Om Gum Ganapatayei Namah,” which translates to “I bow to the elephant-faced deity (Ganesh) who is capable of removing all obstacles. I pray for blessings and protection.” All of these mantras have vibrational power, and have been proven to change your mind in incremental steps. By practicing mindfulness, we are better able to move into challenges and learn how to overcome them instead of shy away from them. Scientific research and imaging of the brains of meditators has found that an electrical change occurs in brain function, thought to reflect the cultivation of an “approach state,” in which we move toward, rather than away from, a challenging external situation or internal mental function such as a thought, feeling, or memory. Naturally, this can emerge as a basis for resilience in human beings. When something upsetting, challenging, or confusing appears in your life, this is the perfect time to practice mindfulness. Anyone can do a basic breathing meditation, at almost any time, no matter where they are, or who they are with. The breath allows space in the nervous system, heart, and brain so that we can see things from a different perspective than before we started to breathe deeply and with more mindful attention. Just try it, and you’ll be blown away by the cumulative effects of this simple practice. How many of us long for more clam, more happiness, more peace, more success, more love, etc. in our lives? We wish for these things like they are in some far-away dream. This attitude keeps us from taking responsibility for our own actions. A wish is a good place to start, but this desire must translate into action. Again, these actions can be small, they don’t have to be monumental, but once taken, and done again and again and again, the results can be profound. Mindfulness cultivation is an action, or set of actions. Don’t’ wait around for more happiness, or a better world. The change truly does start with you – just like Gandhi suggested. Once you have a mindfulness practice established you may notice that you get more done with less effort, but it does indeed take effort when you first endeavor to make change. Mainstream music changes your vibration – were you aware? Not all of it is designed to uplift you and help you connect to Source. One of the ‘secrets’ of the universe, is the creative application of sound frequencies. John Worley Keely discovered this creative use of musical frequencies in the late nineteenth century and accomplished amazing feats that defied conventional physics and confounded the academicians of his day. If you happen to listen Bob Marley on your iPod or music player, then you’ll probably be shifted into stratospheric levels of happiness. He was known to record his music in frequencies that were in alignment with the Schumann Resonances — electromagnetic waves that exist in the space between the surface of the planet and the Ionosphere – 7.83, 14.3, 20.8, 27.3 and 33.8 Hz. They are said to be the heartbeat of mother earth. Many classical composers did the same. Gregorian chants, and most ancient music was tuned to positively affect our vibrations. Pythagoras of Samos understood that playing music which was aligned with the heavenly bodies, could heal us from some of the most dire physical and mental conditions. This is not true of most modern music. The easiest way to tell if music is healing our harming you, is to observe how it makes you feel. Does it cause you to tune out or tune up? Choose your music accordingly, and when you have no other time to practice mindfulness, at least your mind is being altered by the positive and powerful influence of sound. By practicing these small steps – changing your thoughts and actions by 1% every day, slowly you’ll build up to a 100% change. Now that’s something to get excited about!